There were no surprises from Liverpool in their starting 11, captain Jordan Henderson got back into the team after his slight injury, replacing Fabinho in the defensive-midfielder position, creating the Henderson-Milner-Wijnaldum midfield behind the Mané-Firmino-Salah attacking trio, forming their usual 4-3-3 shape. On the other side Pochettino chose a 3-5-2 formation, probably his main reason and goal was to create a better defensive access at the back to control the Liverpool attacking-trio’s different movements. They operate with several vertical switches and runs in behind, so even if a defender is being pulled out of the last line, there still remains 4 players at the back to maintain the control on these runs and create optimal distances between each other, offering a higher flexibility therefore. 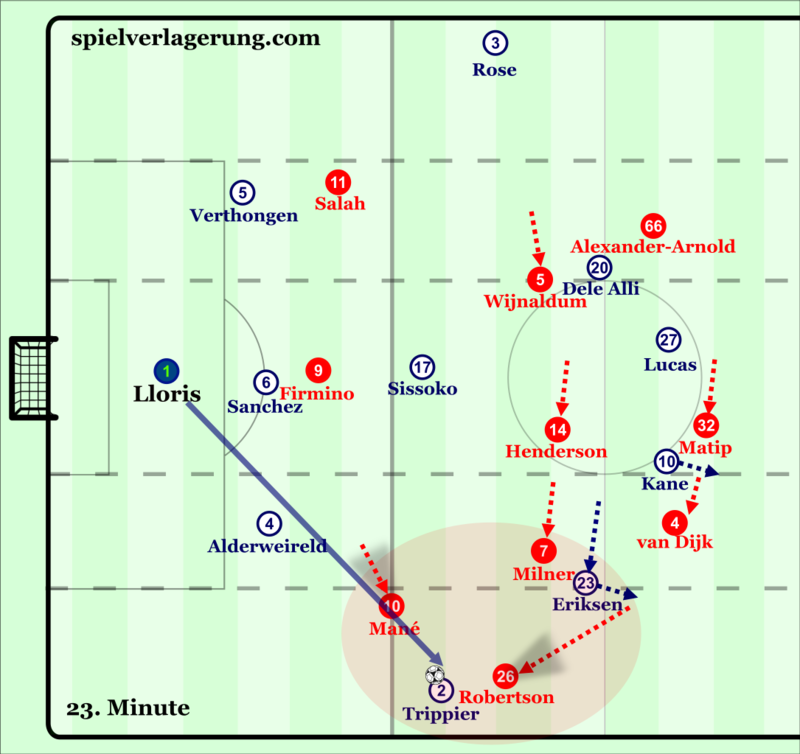 As the basic starting structures shows, both teams chose a shape with 3 midfielders, trying to control the centre of the pitch. In the beginning Liverpool could already force Spurs to play long balls, to create unstructured phases – long kicks, throw-ins etc.-, forcing their possession game off-balance. Build from these phases just after 5-10 minutes Liverpool got into early control on both sides of the ball due to several reasons. The front-3 could press Spurs’ build-up with ease, whilst on the other hand they were able to effectively circulate the ball against the 5-3-2, building through the FBs at the wide areas and using Firmino at the central zones. At the transition phases Firmino was a key player again, as a consequence of Liverpool’s offensive staggering he occupied a deeper positioning in between the lines, therefore he could offer an extra access and control for Pool’s midfielders to overload Spurs midfield 3. With Spurs playing a 3-1-4-2 in possession, Pool could press the 3 centre-backs with the front 3, and as their defensive staggering’s key principle is to have the 2nd line possibly a bit deeper -especially on the near-side-, with the DM closely in front of the last line, they could collect the 2nd balls at the centre. Here still the key was the 1st line’s defensive movements and principles. Firmino closed down the central passing lanes with positioning himself a bit deeper, also forcing backpasses towards Sanchez, the middle centre-back, which was a trigger for Firmino to start pressing him. Salah and Mané were closing down the outside channels, to block the passing lanes towards the wing-backs, in that way to avoid being moved during Spurs’ ball circulation, forcing the ball to “stay” in the centre, which is controlled due to the aforementioned defensive staggering -this also allows the FBs to maintain a more narrow positioning, only shifting higher if the ball gets out to the wide zones. With these defensive movements from the 1st line, they could force lot of backpasses from Spurs’ 3 CBs immediately after horizontal passes between each other. Also, a key aspect was not only the covering angles, but the optimal distances from Salah-Mané, who could not only close the outside passes towards the WBs, but could also close down the sidebacks right after their 1st touches, to reduce their time for the on-ball actions. 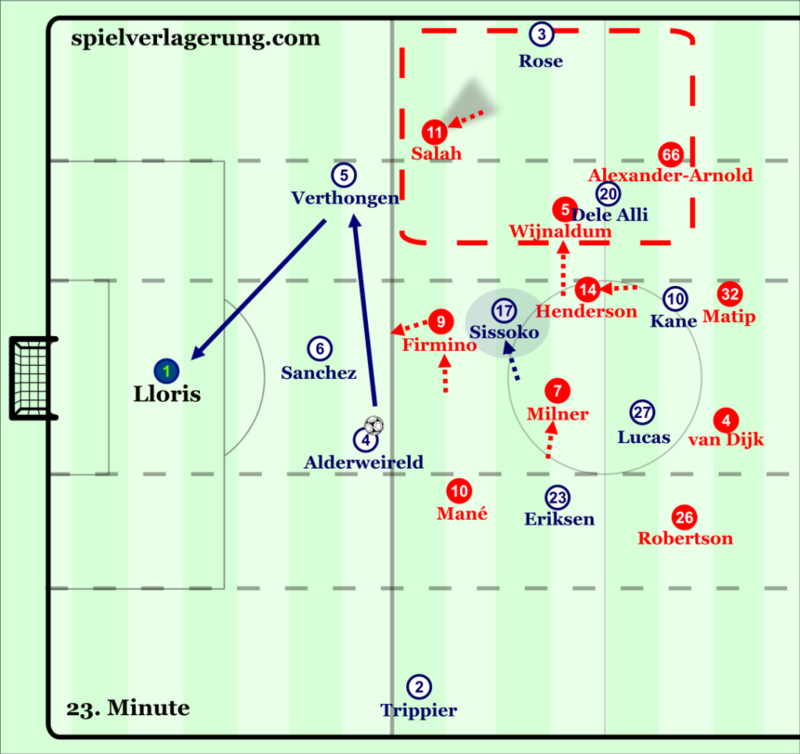 With this reduced time Spurs’ midfield 3 also had less time to optimally position themselves behind the first-line, the option-orientation allowed Pool’s 2nd line to stay further back and offer central support. Liverpool’s first-line’s pressing angles, plus the option-orientation on the right-side. 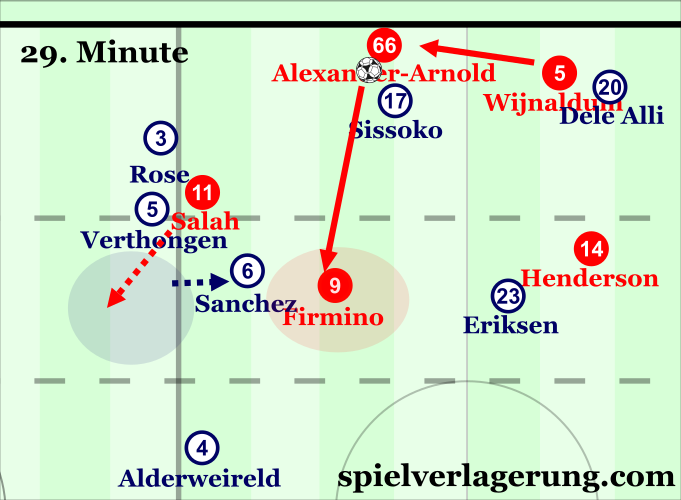 As Verthongen receives the horizontal pass Salah closes him down, whilst covering the outside pass towards Rose, allowing Wijnaldum and Alexander-Arnold in behind to maintain their central positions. Also key here the 2nd line’s shifting, Milner closes towards Sissoko at first, but as Sissoko moves towards the ball Henderson shifts out, preventing any ‘overshifts’ from the 2nd line. Shifting dynamics: after the switch to Trippier Robertson immediately closes him down, with the 2nd- and last-line heavily shifting towards the left. Remember the previous picture, how the 2nd line shifted, allowing now for Milner to move out wide and cover Eriksen. With these shifting movements Liverpool had the control without the ball, closing Spurs’ possession with high local compactness in the ball’s zone. 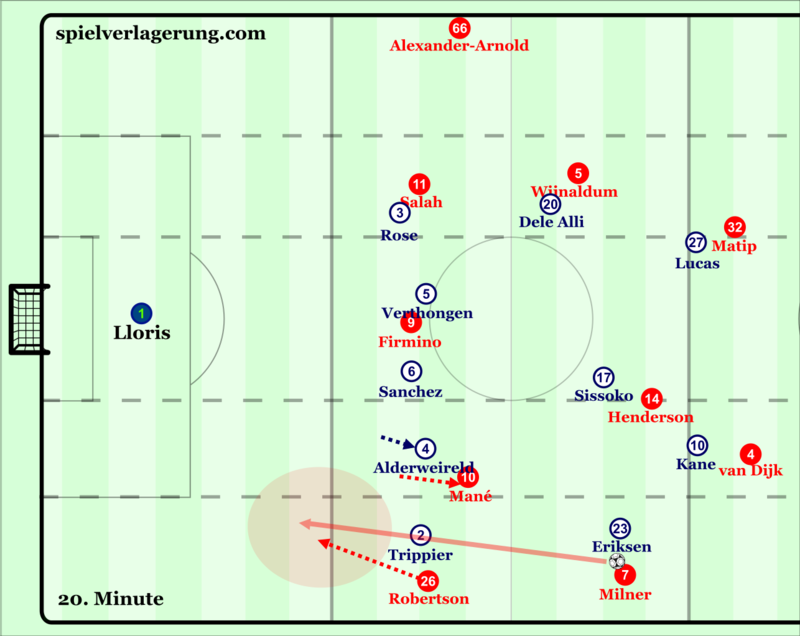 But they also controlled the game with the ball, easily exploiting Spurs’ defensive issues at the wide zones. In possession Liverpool basically formed a ‘diamondish’ 4-3-1-2, with Firmino dropping deeper -false 9 role, into CAM position practically- and Mané & Salah moving inside, in between the sidebacks-wing-backs. This often forced/pinned WBs deep and narrow, to create spaces for Robertson and Alexander-Arnold whilst circulating the ball. As Spurs’ last-line often man-marked heavily, the front-3 could open up spaces for each other in behind -e.g. Mané-Firmino dropping deep on the left opened up huge spaces on the far-side for Salah to run into. With Spurs WBs being this deep and narrow, Pool could easily make switches to the far-sided FB, who arriving from depth could drive forward into a lot of space. Eventually this also affected the 2nd line’s shifting, since the wing-backs defending forced Dele Alli and Eriksen to drift out wide to close Pool’s FBs, which stretched their 2nd line horizontally. With the 2nd line got manipulated this not only opened up even more spaces in the far-side, but also spaces in between the lines for Firmino to receive and turn -plus to offer support after switching the ball wide-, as Sissoko had to step out more often in the central zone -this was the key strategic point in the 1st half. Left sided dynamics, with Milner’s outward movement. Firmino’s deep position pins Sissoko -stretching the 2nd line-, allowing Milner to get separated -also from Trippier, as he is far from him to move out of position. 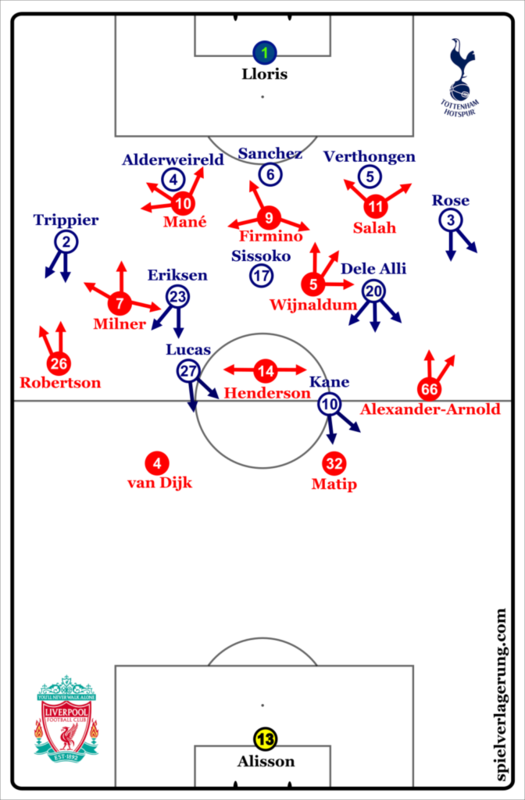 Also important to note Pool’s asymmetry in possession, whilst Wijnaldum occupied higher positions on the right side to make runs in behind -vertical switched with Firmino also, to exploit the generated spaces-, Milner made more outward movements to create wide overloads on the left side with Robertson, exploiting Spurs’ narrow 2nd line and to eventually stretch the 2nd- and last-line as well. From a game dynamics point of view, these processes led to Spurs defending very deep in front of their box, allowing Pool to control the tempo and the space on the opposite half. Circulation dynamics: as Matip drives forward the right sided overload with Firmino’s positioning pulls the whole shape over -manipulating the 2nd line’s shifting!-, opening up space on the far side for Robertson. After constantly switching to the ball-far FB, Liverpool could stretch Spurs’ 2nd line, manipulating Sissoko to move up higher or move outwards, opening up space for Firmino to receive in between the lines. As Firmino’s position pulls Sanchez out of the last-line, Salah immediately makes a diagonal run into the vacated space. With basically creating a 1-2 staggering upfront, interesting movement patterns arose to penetrate Spurs’s last line in between the 3 attackers. Even though Spurs’ last line narrowed themselves, which caused their inactivity to close the wide areas, Mane and Salah could exploit several holes to make runs in behind. Spurs’ WBs’ actually had to share their orientation and attention, resulting in just being in between 2 positions: not being narrow enough to close the channels and also not being wide enough to close down Alexander-Arnold or Robertson. Therefore Mane and Salah could make runs into these channels. From their positions they could also pull out either centre-back(s) to open up spaces in behind for Salah-Mané, or for Firmino who made the runs from depth. Vertical switch on the left side, plus Milner’s outward movement. Here, with creating a 2-3-5 shape they could stretch again the 2nd line, therefore the wingers could better manipulate the last line -who has been left without cover. As Mané drops it pulls Alderweireld out just enough, so that Robertson can make a run in behind in between Trippier and Alderweireld. In reaction to this, Spurs changed structure in the 34th minute, bringing Lucas deeper on the left side to switch into a 5-4-1 in defending -and 3-4-3 in possession. This resulted a slightly better control at the wide zones from the 2nd line, but a worse defensive coverage at the centre. After this change, Henderson had even more space to receive in front of Spurs’ 2nd line -to switch the ball to the far-side, or to find Wijnaldum-Firmino at the centre. In possession though the build-up dynamics got better with having 2 CMs deeper in front of the CBs to reduce the cover and the press from the 1st line, switching the ball into the wide zones more effectively. For the 2nd half Spurs changed their shape into a 4-2-3-1, pushing Rose higher into the LW position -staying wide-, Verthongen moved to LB, Eriksen moving to RW -being inside-, creating an asymmetric shape, which basically changed the game’s dynamics, especially in the building phase. With creating a 4-2 staggering at the back, they could reduce Pool’s press and cover, eventually penetrating behind Pool’s 1st line pressure. Having 2 CMs deeper caused a huge issue for Firmino at the centre about which passing lane or zone to close down, resulting an open passing lane to either CMs -depending on Firmino’s covering angle. 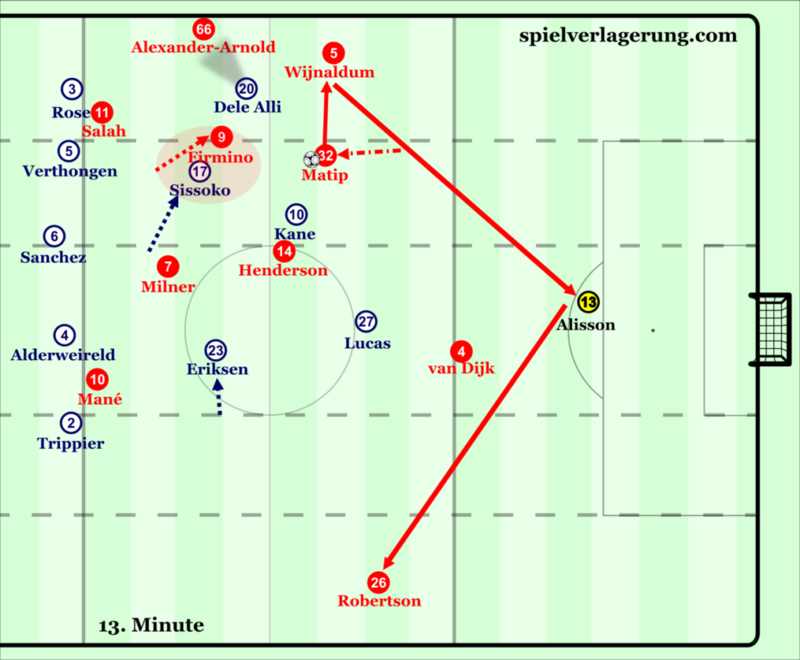 A key reason of the changing dynamics though was the optimal distances between the CBs, Alderweireld and Sanchez, whilst circulating at the back. With the being closer to each other the ballfar CB’s positioning forced Pool’s wingers to close a much bigger angle from a higher distance -if they positioned themselves too close to have better access towards the CBs, then it was easy for Spurs to switch to the ball-far FB. This also allowed more time/space on the ball for the CBs to effectively make switches at the back and control the circulation. With creating a central 2-2 staggering Spurs basically doubled up on Milner-Wijnaldum, keeping them in a constant decisional crisis. If they moved up too high to close Dele Alli-Sissoko, then either Eriksen or Lucas opened up in the halfspaces, therefore they much rather stayed deeper, allowing easier progression for Spurs behind the 1st line. Eventually this reduced the press and cover from Salah-Mané, offering even more time at the back to build. From here Spurs could build with more fludity, and was able to effectively use the wide zones to rotate from the back, and stretch Pool’s 2nd line. If the 2nd line shifted to close Trippier or Verthongen, then central spaces opened up, and even direct passing lanes to Kane for the CBs to build diagonally though him – as Son came in, he made runs in between the CBs, opening up space for Kane as he dropped deeeper. 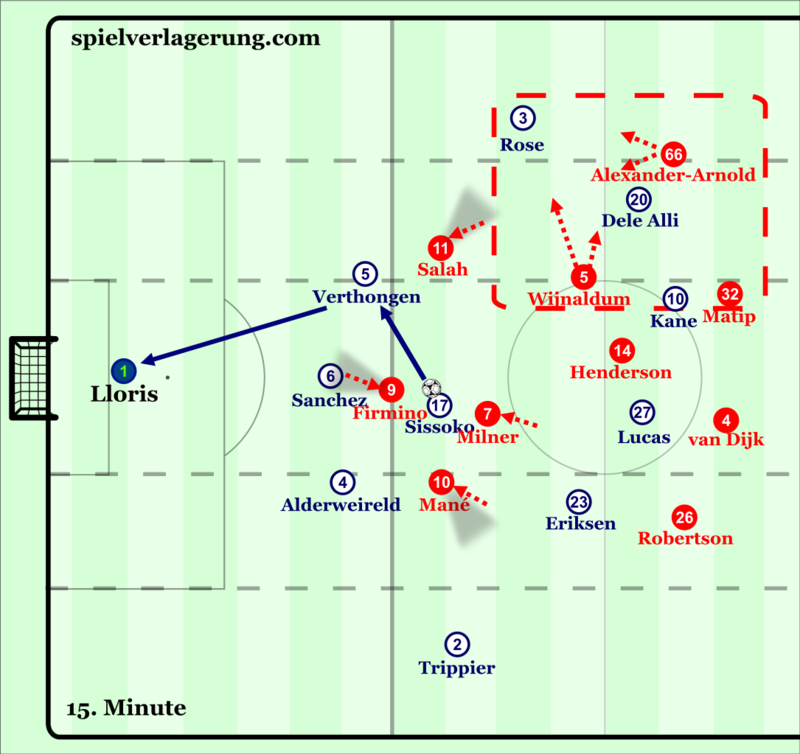 If the FBs pushed higher up at the flank, then Eriksen-Lucas made runs in behind from the halfspaces, improving the wide dynamics, therefore Spurs found solutions against either of Liverpool’s shifting methods. 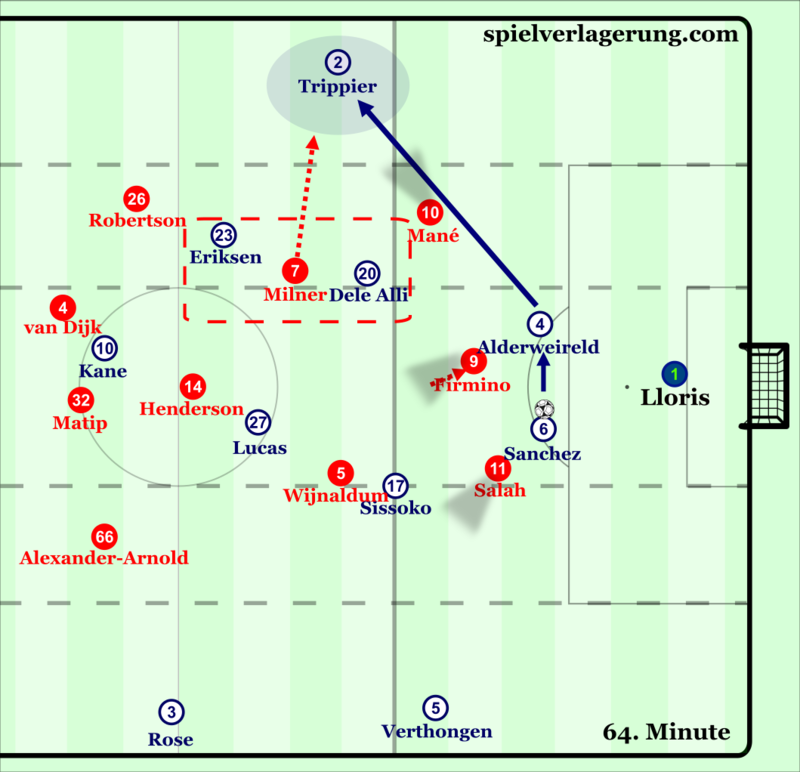 Liverpool’s pressing issues against Spurs’ 4-2(-2) structure: Firmino closes Alderweireld sidewards -cutting access towards Sanchez-, which opens up even more spaces centrally, causing Milner to get doubled against Alli and Sissoko. As Alli drops deeper Milner follows him, leaving space for Sissoko to make a movement into -Wijnaldum also can’t follow him across, as that would open up tons of spaces on the left for Eriksen-Trippier. Also Henderson’t can’t shift out, since a possible outward movement from Lucas would get him more easily separated in the halfspace -even if Matip follows him, then central spaces would open up. Switching into a 4-2 staggering at the back is something Manchester City also used in both of their league games against Liverpool this season – a possible antidote against Pool’s high 4-3-3 press. Some of the possible adjustments from Liverpool against the 4-2 is to pull Firmino deeper whilst pressing high to close towards the ballnear CM -ballfar CM can move up higher to close towards the ballfar CM, creating better ballnear compactness-, therefore the Ws have to position themselves differently to create access towards the CBs. 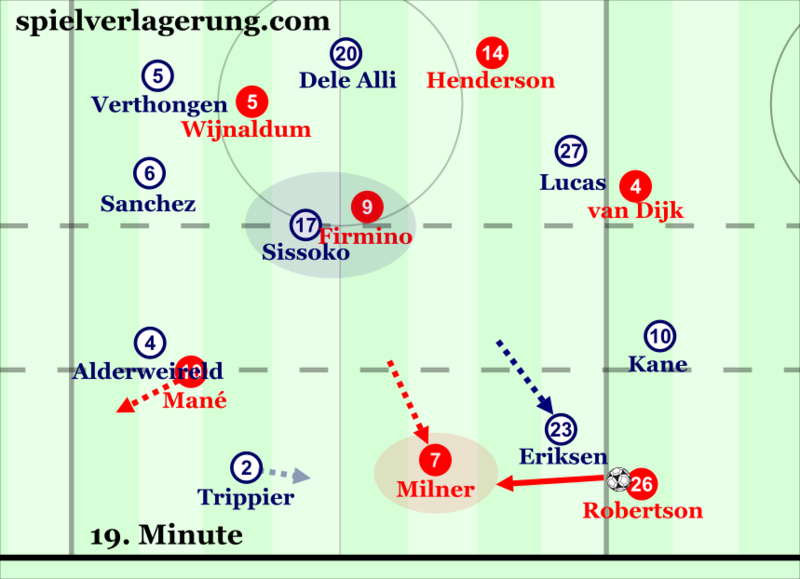 This is what happened after 10-15 minutes in the 2nd half, as Firmino varied his covering angles and waited for more optimal triggers to move up higher, but since Spurs CBs reacted to this well, the aforementioned dynamics arose. Another possible adjustment is to change the shifting system -e.g. CMs to step high up to close either CBs-or the formation itself -from 4-3-3 to 4-2-3-1, which Klopp eventually did after Spurs’ equalizer. The distance between Sanchez and Alderweireld was the key to reduce the press and cover: as Alderweireld receives, he has enough time to make an outward touch and switch to Trippier in behind Mané, since Alli and Eriksen pin Robertson and Milner in position, opening up the flanks. With Eriksen pinning Robertson it’s Milner, who has to shift out wide to close Trippier, stretching the 2nd line horizontally more. What was interesting is Liverpool’s inability to effectively change or to adapt to Spurs’ halftime adjustments, therefore Spurs could comfortably control the game until the equalizing goal, which forced the home side to make some changes. With a double-sub Pool switched into a 4-2-3-1, which again changed the game’s dynamics. After that Liverpool pressed with a 2-men/4-men 1st line, putting both of the Spurs’ CBs under pressure frontwise, therefore they could better close down the passing lanes towards the Spurs CMs. In possession though neither teams were able to create established phases, and more of the chances came after counterattacking situations. Still, in the end Liverpool won the game, thanks to a lucky Alderweireld own goal after Salah’s header, from an offensive corner situation. The recuperation movements after a set-piece is a key phase, which rarely get mentioned and often stays under the radar. Spurs uses the most common mixed system -in this case 7 man-markers, 2 zonal-markers-, where a probable weakness might be the lack of stable structure which after a set-piece rebound, As the ball gets headed out/cleared the whole “shape” – players – move out, but it’s noticeable, that they don’t have any kind of structure at all, therefore the far-side becomes uncontrolled, where 2 Pool players got separated thus . Even if you mark man-to-man, you still need to have a shape -which could be to hold onto the ending position after marking the oppositional routes, to maintain access towards the opposition-, in order to be effectively positioned in these unstructured recuperation phases. If you rewatch just notice Trippier’s movement on the far side, moving towards the ball, losing his marked player, resulting Salah & Firmino to be more open behind Alderweireld -the only player, who makes a shoulder check before TAA’s cross. From an offensive point of view though, this is the optimal counter-movement to make against a heavily ‘outmoving’ oppositional defense. When the shape/last-line aggressively moves out in reaction to the ball’s backwards movement, the defenders have to position themselves in relation to the teammates -e.g. keep the line’s height-, resulting a weakening control on oppositional players, a possibility to make blind-sided runs from depth -exploit defenders’ visual orientation on the teammates & ball- to create a dynamical advantage from the opposite movement. In overall, it was interesting to see 2 basically opposite halves in terms of control, Liverpool dominated the first half, due to their basic approach, their ability to constantly press high and to have controlled possession phases on the oppositional third, although Spurs’ system change in the 2nd half completely turned the game around especially until the equalizing goal. 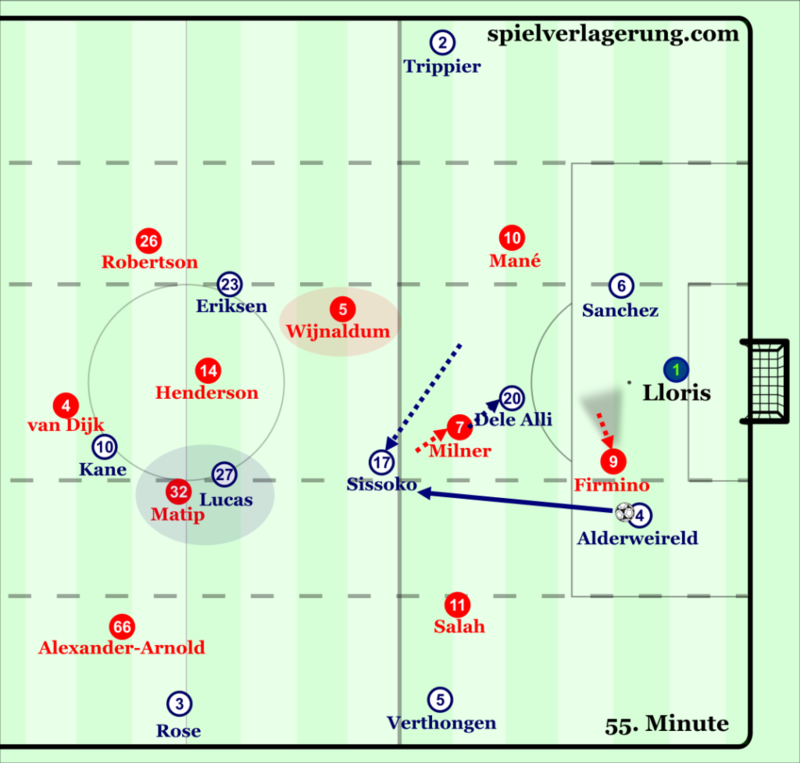 Whilst Liverpool showed high fluidity in their offensive movements to cause several problems for Spurs’ 2nd- and last-line, Spurs’ switch to the 4-2 staggering to build from the back brought up Pool’s pressing issues against these build-up systems.